The Elim Oasis Centre. This is only a 5 minute walk from Huddersfield University and very easy to find in the town center. 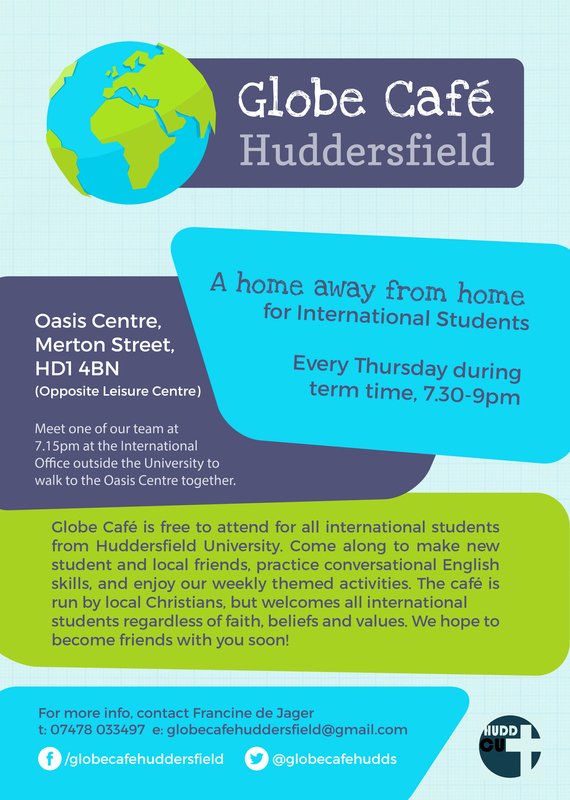 Globe Café is free to attend for all international students from Huddersfield University. Come along to make new student and local friends, practice conversational English skills, and enjoy our weekly themed activities. The café is run by local Christians, but welcomes all international students regardless of faith, beliefs and values. We hope to become friends with you soon! The Globe Cafe is completely free to attend. All of our Thursday evening activities are free. We occasionally do extra day trips to other places, if any costs are required, we would inform you in advance.